Kie Matubu is famous by North Maluku People as Tidore Mountain, because it located in Tidore Island. 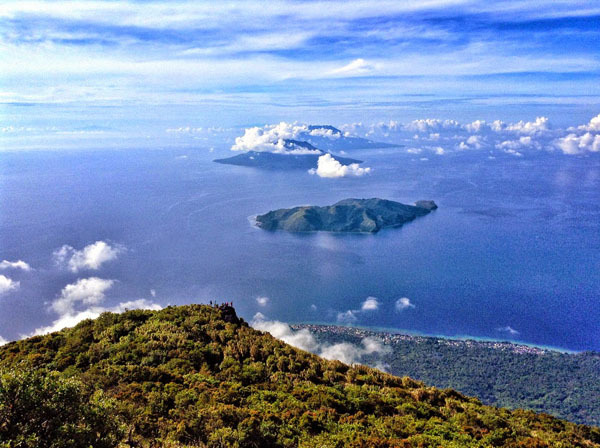 The peak of Kie Matubu is the highest point in North Maluku with the height of 1730 meter above sea level. At this peak, you will be presented by stunning view that span over the eyes, like Maitara Island, Ternate Island, Hiri Island, Halmahera Island, Mare Island, Moti Island, Makian Island and else. At night, we can see the sparkling sight of Ternate city from the peak of this place. Precisely at Gamalama foot, we can enjoy the breezy night while enjoying the sparkling stars and the sparkling glimpse of lamps under the city crowd. The perfect time for visiting this place is in the middle of the month, when the moon is full. The dramatic nuance will be more appears during full moon, and we can also enjoy the grace of sunrise or sunset from this place. Moreover, for those who love to stay longer can build the tent and camping at the peak of Kie Matubu. Here we can see the tremendous Mare Island, Moti Island and Makian Island from south side, while from west side we can see Halmahera Island. To reach Kie Matubu we can start the journey from Rum Port to Soasio city,for about 45 Minutes and we can continue to Gurabunga village for about 20 minutes. We can rent private vehicle or publict transportation to go to this place. At Gurabunga village, we have to ask permission to Shi, or head chief from Gurabunga village before exploring the place. There will be no entrance fee to go to this place, and the Sohi will give direction to explore the place. It takes 4 hour to hike the mountain, and keep honor the nature by not doing something harm.